Daniel Ricciardo has pinned Red Bull Racing’s poor qualifying showing on a lack of engine performance, but the Australian is hopeful his car will be more competitive in race trim. 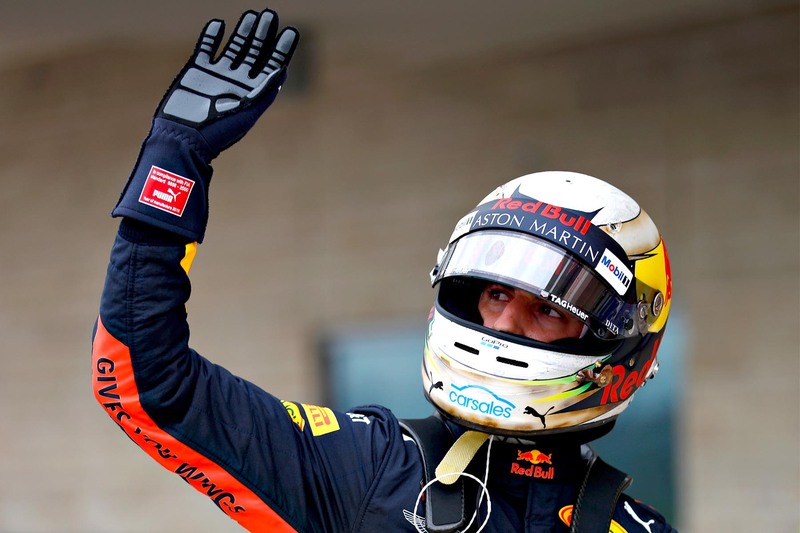 Ricciardo’s best lap was more than 1.2 seconds off Lewis Hamilton’s pole position time, a deficit made substantially worse by Ferrari’s Sebastian Vettel running the Briton close, with just a 0.061-second deficit splitting the pair. But the 29-year-old said his team’s hopes were undone by the current generation of regulations making the Circuit of the Americas more sensitive to engine power, putting Red Bull Racing as a disadvantage. Whereas once RBR’s powerful chassis and aerodynamics package would be advantageous by allowing its drivers to carry more speed through Austin’s sweeping sector-one bends, the overall lift in downforce brought about by regulation means all teams now have access to that ability, making engine performance the key differentiator. “The first sector is a power sector as opposed to a downforce sector,” he said. “Turn two is full, three is full, four is full, five is full, six was a microlift — that’s as good as full now. “In the end, if we’ve got more downforce, we’re not gaining there; we’re losing. “If they’re full with more power, it’s being magnified. But Ricciardo also said the Mercedes is simply in another league. While Red Bull Racing has tended to suffer in qualifying I recent seasons thanks to Renault lacking the maximum performance modes developed by Mercedes and Ferrari, it has tended to close in on the two leading teams during the race, when the respective power units are turned down. With Sebastian Vettel demoted three places on the grid to fifth, promoting Ricciardo up to fourth, Daniel believed he had an opportunity to keep the faster Ferrari behind him over a race distance. Tyre strategy may also gain him another place, with Kimi Raikkonen, who will start from second place, the only driver in the top five to have to use the ultrasoft compound in his first stint as opposed to the supersoft preferred by both Mercedes drivers, Sebastian Vettel and Ricciardo.